remembered Vajpayee as an outstanding parliamentarian, prolific orator and a finest poet in the contemporary Hindi literary world. 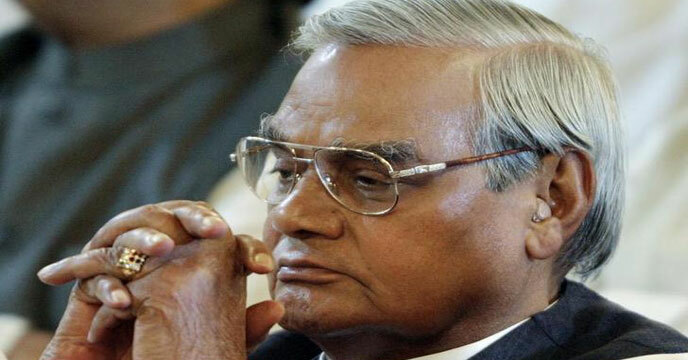 Late Vajpayee’s persona and aura won him accolades and salutations the world over, he said. “One of the most respected parliamentarians in modern times, he was fondly called as Azatshatru across the political arena. His love for the country found reflections in his poems enriched with nationalist fervour, his will power as the leader of the country to attain the nuclear capability to secure the sovereignty and integrity of the country despite international pressures and sanctions makes him the tallest leader among his contemporaries. His vision for the developed India of twenty-first century and his initiatives to create the world class network of highways across the length and breadth of the country, the golden quadrilateral, the project of linking rivers, Pradhan Mantri Gram SadakYojana etc have inspired the Young India and have touched the lives of millions,” the Governor stated. Sikkim Chief Minister Pawan Chamling also recorded his sadness on the demise of the former Prime Minister Atal Bihari Vajpayee. “The nation has lost one of its tallest statesmen and a worthy son of the soil. His passing away is the end of an era. It is an irreparable loss to our country and the people of India. May the soul of the departed leader rest in peace,” posted the Chief Minister in his social media page. The ruling Sikkim Democratic Front (SDF) has also mourned the demise of Late Vajpayee. SDF spokesperson Bhim Dahal told media persons that Vajpayee was like a guardian to Sikkim and Chief Minister Pawan Chamling. Dahal was the MP from Sikkim during the BJP-led NDA government. Dahal pointed out that Vajpayee had visited Sikkim and two important demands of Sikkim had been resolved during his term as the Prime Minister. The demands were ST status for Limboo and Tamang communities and inclusion of Sikkim in North Eastern Council (NEC). The demand for reopening of Nathu La border trade was also blessed by Vajpayee and it came to fruition during the Man Mohan Singh government, it was shared. Sikkim Krantikari Morcha (SKM) president P S Golay also expressed his heartfelt condolences over the sad demise of Bharat Ratna Atal Bihari Vajpayee. He stated that the country has lost the greatest leader and one of the finest Prime Ministers of the nation. State BJP president D B Chauhan has also expressed his deep condolences on the demise of Vajpayee.